Despite trailing behind Donald Trump in the polls for months, Ted Cruz came through with a strong victory in the first 2016 caucuses on Monday with 28 percent of the vote. The win is obviously good news for Cruz's campaign, validating that he's a viable GOP nominee and could rally enough support to out perform Trump's grandiose campaign. 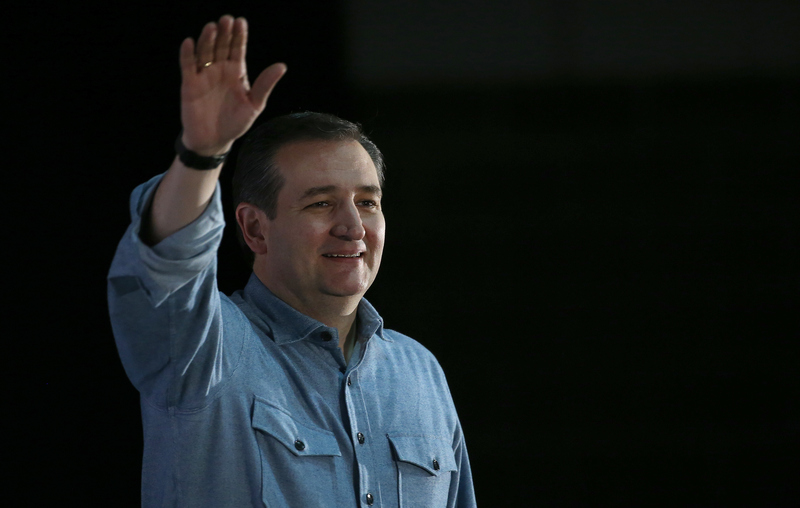 Cruz's Iowa caucus victory speech focused on everyone that his win is a victory for. More than 180,000 people showed up at the Republican caucuses throughout the state, breaking the 2012 record of about 121,000 voters, according to ABC News. Of course, Cruz brought this up in his speech, bragging that he won the Iowa caucus with the highest turnout of voters in history. The Texas senator spoke so enthusiastically that you would have thought he was celebrating winning the GOP nomination, or even the presidency — needless to say, he was pretty pumped. Towards the end, he brought up how many donations he's received, clearly trying to encourage more supporters to give money to his campaign. He wants to build upon his success in Iowa as he now heads into New Hampshire and the other upcoming primaries. God bless the great state of Iowa. Let me first of all say — to God be the glory. Tonight is a victory for the grassroots. Tonight is a victory for courageous conservatives across Iowa and all across this great nation. Tonight the state of Iowa has spoken. Iowa has said notice that the Republican nominee and the next president of the United States will not be chosen by the media, will not by chosen by the Washington establishment, will not be chosen by the lobbyists, but will be chosen by the most incredible, powerful force where all sovereignty resides in our nation — by we the people, the American people. Tonight, thanks to the incredible hard work of everyone gathered here, of courageous conservatives across this state, we together earned the votes of 48,608 Iowans. To put into perspective your incredible victory that you have won tonight, that is the most votes ever cast for any Republican primary winner. Tonight is a victory for millions of Americans who have shouldered the burden of seven years of Washington deals run amok. Tonight is a victory for every American who's watched in dismay as career politicians in Washington — in both parties — refuse to listen and too often fail to keep their commitments to the people. Tonight is a victory for every American who understands after we survived eight long years of the Obama presidency, that no one personality can write the wrongs done by Washington. The millions who understand that it is a commitment to the Constitution to our shared resistance that we rise and return to a higher standard, the very standard that gave birth to the greatest nation that this world has ever known. Tonight, Iowa has proclaimed to the world morning is coming. Morning is coming. From day one, this campaign has been a movement. From millions of Americans from across this country to organize, to rally, to come together, whatever Washington says, they cannot keep the people down. And tonight is a testament to the people's commitments, to their yearning to get back to their core commitments, free market principles, Constitutional liberties, and the Judeo-Christian values that built this great nation. When the Washington lobbyists settled on other candidates in this race, when the media said in one voice that a conservative cannot win, nationwide, over 800,000 contributions to TedCruz.org as courageous conservatives said, "Yes we can!" Eight hundred contributions at TedCruz.org with an average contribution of $67. That is the power of the grassroots. But it's more than that. It's 12,000 volunteers here in the state of Iowa. It's over 200,000 volunteers all across this great nation. You know, during the course of this campaign, people have asked Heidi and me, "Are you tired?" And I will admit, it is 16-18 hours a day, 6-7 days a week. We are not tired at all. To the contrary, we are inspired by each and every one of you. I leap out of bed every morning amazed that at a time when our country is in crisis, everyone of us has the opportunity to stand and lead that we have been put in a place of leadership for such a time as this. Part way through the speech, Cruz's supporters started chanting his name, perfectly exemplifying the triumphant energy in the room. Along with a personal victory, Cruz felt that the Iowa caucus was a win for every conservative that wants a change.